The Revolution Continues : We've Got The Power! It seems like our fight for fair and compassionate health care coverage in the USA has been going on forever. No kidding, it really has been going on for decades. The struggle started before most of us were born--and that includes the Baby Boomers. Millions of Americans without access to affordable health care just didn't spontaneously occur overnight. Our current patchwork system of private health insurance and government programs (delivered by for-profit corporations) took a while to blend, ferment and congeal into the stinky state of unpleasantness it is today. Many of us despair of living long enough to witness a happy ending or an ending of any kind. Recent wheelings-and-dealings in the Senate on Trumpcare have sent shockwaves of horror cascading across the country. Will our family lose our Obamacare coverage? Will a loved one suddenly be without life-saving medicine or treatment? How can we afford to put Mom or Grandpa into a nursing home without mortgaging our house or losing our jobs to take care of them at home? Are we even physically capable of taking care of them without injuring ourselves? These pressing questions keep us awake at night. They cause us to bemoan our fate of living in one of the last nations on Earth who thinks health care is a privilege of the wealthy few, not a human right. "Make America Great Again!" chant the mindless masses that don't see it's our idolatrous worship of endless profiteering which has created its downturn in the first place. However did we stumble and fall down the rabbit hole of greed and wind up in this surreal nightmare of narcissism? If you think I'm just a whiner, take note: All is not lost--I believe we're actually winning this battle. We the People are making inroads into Washington, D.C., in spite of the corporate lobbyists paying dearly to put up roadblocks to our success. We have steered the narrative and driven the discussion into the direction we want it to go--toward instituting universal health care for all Americans. Because of this, we can honestly sing We are the Champions and pat ourselves on the back. But now is not the time to let up. Now is the time to continue to hammer the point into the pointed heads of our senators and congresspersons and media pundits. Now is the time to share information about H.R. 676, the Improved and Expanded Medicare for All Bill, currently introduced into Congress with everyone we meet. I realize we're repeating ourselves like a broken record at times, but it's worth it. The flooded voice mails, jammed switchboards and bursting email inboxes demonstrate our resolve and unanimity of purpose. Our elected officials are quaking in their boots, and well they should be. 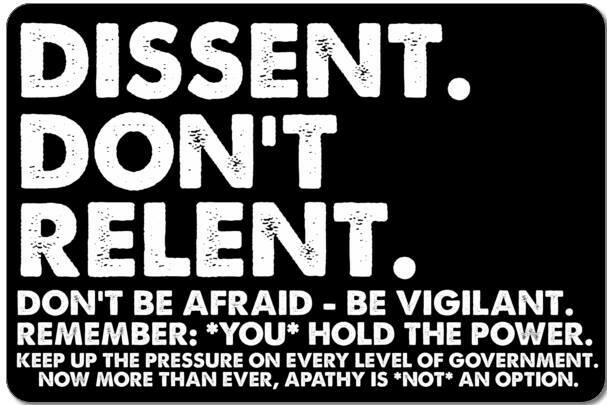 We're awake, aware and, most of all, we are onto them and their corporate paymasters, and we're not letting up until they do as they're told or they pack their bags and leave governance to those who put the people's interests first. We the People want a Medicare for All, single-payer, universal health care system. It's that simple. We will have it. All we have to do is keep fighting and never give up, never surrender. 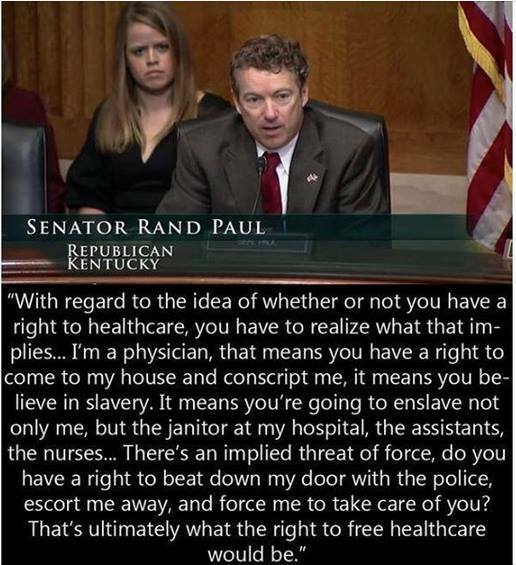 Health care is a necessity. Exactly 52 years ago, President Lyndon Johnson signed Medicare into law. This social insurance plan was created to give health insurance to seniors and was later expanded to those with disabilities. Now, more than ever, we need to build upon this program and expand it to provide universal health care coverage as a right for all Americans. All means all. Everyone in our country should be able to go to the doctor when they are sick. Everyone, regardless of income, should not have to choose between getting the care they need and feeding their family. Together, we must push the leaders of our country to embrace health care as a human right. This past week you helped push three Republican senators to stand up for what is right and vote against the so-called “skinny repeal” of the Affordable Care Act. Thank you for making thousands of calls to your Senator's office and expressing the need to protect health care in our country. There is still significant work to be done to improve our nation's health care system. Please add your name to our pledge to expand Medicare for everyone and tell us why this matters to you. This summer we will gather even more support for Medicare for All and a slate of necessary bills that speak to the needs of people all across the country. Our People's Platform is just the beginning of how we will transform our country together. Share why you're fighting to expand Medicare to every American. With your help, we can keep the momentum going and expand our health care system to one that covers everyone. 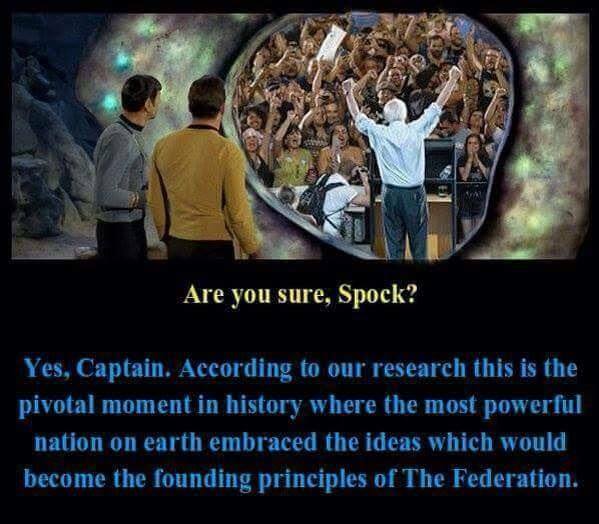 We have already come so far and with you by our side I am more confident than ever in our political revolution. Bernie Sanders asks for our thoughts on Medicare for All. Let me take this opportunity to give you an update as to what's been happening in recent weeks. As you all know, the disastrous Republican "health care" proposals have, for the moment at least, been defeated. They were defeated because millions of Americans stood up and fought back. They made phone calls and sent emails, letting members of Congress know how they felt. They got their friends involved in the struggle by utilizing social media. They attended town hall meetings. They went to rallies, including some that I attended in Michigan, Maine, Nevada, Arizona, West Virginia, Ohio, Utah, Pennsylvania and Kentucky. No. We will not be throwing 32 million, 23 million, 22 million or 16 million Americans off of health insurance in order to give tax breaks to the rich and large corporations, and to further the right wing extremist ideology of the Koch brothers. No. We will not be cutting Medicaid by $800 billion, raising premiums for older workers, defunding Planned Parenthood and making it almost impossible for people with pre-existing conditions to get affordable insurance. Needless to say, while we have won at least a temporary victory by defeating horrific Republican proposals, that is not good enough. We need to go on the offensive, not simply remain in a defensive posture. The status quo is not satisfactory. Too many Americans continue to have no health insurance. Too many are paying premiums, deductibles and co-payments that are much too high. Too many cannot afford the outrageously high cost of prescription drugs they need. Too many cannot gain access to high quality primary health care or dental care, even when they have insurance. Our goal is not complicated, and it is not radical. It is to have the United States join every other industrialized country on earth in guaranteeing health care for all. Health care must not be considered as a privilege or a commodity. It is a human right to which every man, woman and child is entitled. Our goal is to create a rational, cost-effective health care system. 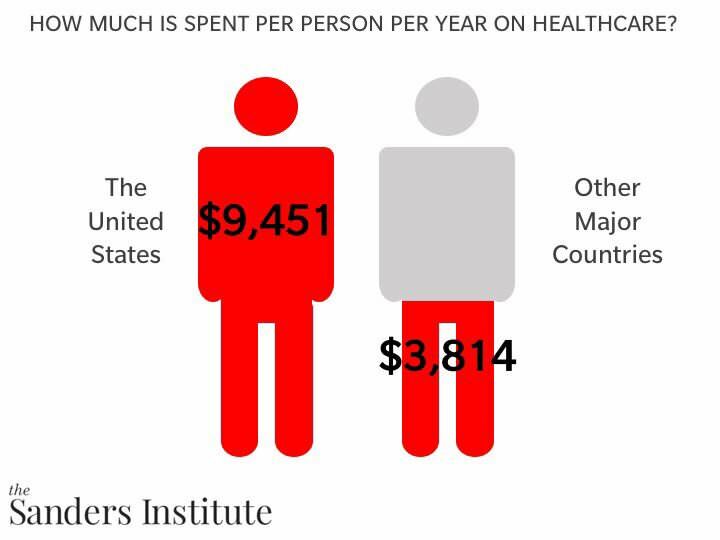 Today in the United States, we are spending almost $10,000 a year per person on health care. This is absurd and unsustainable. We must not continue a system which is, by far, the most expensive, wasteful and bureaucratic in the world. Our goal is to put health care dollars into disease prevention and the provision of health care, not insurance company profits, not outrageous salaries for health industry CEOs, not advertising, not billing, not lobbying or campaign contributions. Our goal is to move this country to a Medicare-for-all, single-payer system. Let me be clear. This will be an enormously difficult and prolonged struggle, and one which will require the efforts of tens of millions of Americans in every state in this country. It will, in fact, require a political revolution in which the American people participate in the political process in a way that we have not seen in the recent history of our democracy. In order to pass a Medicare-for-all, single payer system we will be taking on the most powerful special interests in the country: Wall Street, the insurance companies, the drug companies, the corporate media, the Republican Party and the establishment wing of the Democratic Party. In opposition to our efforts there will be a never-ending barrage of TV ads, editorials, political attacks and lies. If we are going to be successful in this struggle, we have got to be smart – very smart. Not only do we need strong legislation (which I will be offering shortly and an outline of which I will be sending to you), but we need an unprecedented organizing and educational campaign. 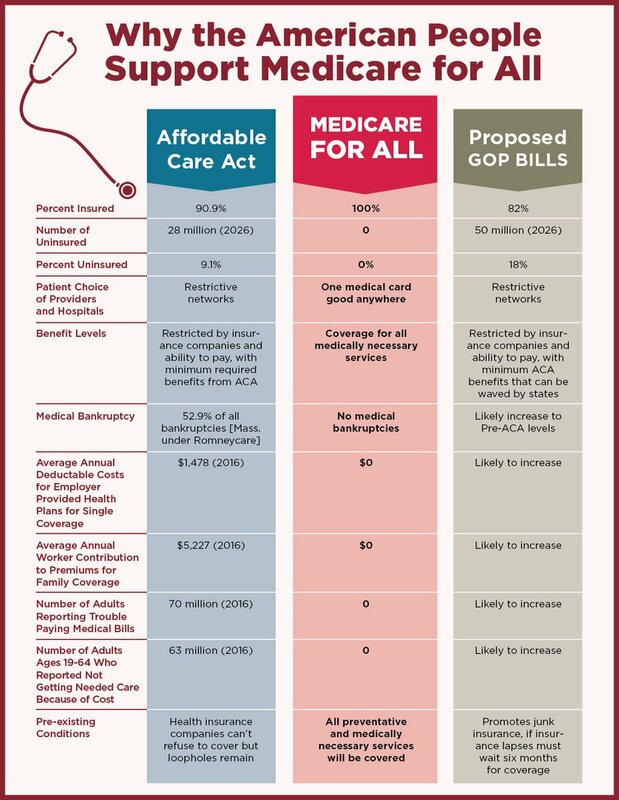 How do we counter the lies and distortions against Medicare-for-all that is sure to come? How do we make certain that all of us – men and women, gay and straight, black, white, Latino, Asian-American, Native American -– are in this struggle together? How do we bring young and healthy people to stand alongside the elderly, the sick and the poor? The battle that we are undertaking is enormous and unprecedented in the modern history of our country. Please send us your ideas as to how we can best go forward. Please give us your vision of what a humane and rational health care system looks like. Please share your experiences with the current system. Please help us map out an effective political strategy. We are in this together. We need everyone's ideas. Thanks again for your support and all that you are doing. In 1948, President Harry Truman announced the integration of the armed forces. Today, President Donald Trump announced, via a tweet, that transgender people will now be barred from serving in the military "in any capacity." This is purely based on prejudice, not on military readiness or concern for the safety and security of our troops. A person's ability to serve our country has nothing to do with gender identity or expression. This ban is discriminatory and dangerous and will prohibit able-bodied people from enlisting or continuing to serve in the armed forces. The President claims erroneously that the cost of medical care for transgender troops is an adequate reason for denying transgender people the ability to serve in the military. Not only does this discount the worth of people who put their lives on the line every day, but it also comes in the middle of a blatant attempt to deprive millions of people of access to affordable healthcare by repealing the Affordable Care Act. “The President’s announcement of a ban on transgender military service members is discriminatory, unsound policy which will deprive able, capable people of serving and defending our country. Our President has chosen, via Twitter, to announce a reversal of a critical military policy based purely on prejudice, not sound judgment. Are we now going to ban all women from serving in the military, too, despite all evidence that gender has nothing to do with a person’s ability to serve? This is a giant, dangerous step backwards. Our nation’s previous “Don’t Ask, Don’t Tell” policy did not even ban LGBT service members outright, and all it did was force military members to serve while in the closet. It hurt our troops and established a dangerous culture of undeserved punishment; we are still apologizing to and rectifying the dishonorable discharges of people who were forced to leave the military solely because of their sexual orientation. Progressive Congress Action Fund is a 501(c)4 organization that serves as the vital linkage between progressive Members of Congress and grassroots organizers around the country, turning bold policy ideas into action and advancing a progressive agenda. From Open Media: Millions of Americans have submitted comments to the FCC to stand up for an open web — this is our chance make them count. Anti-Net Neutrality forces have used bots and submitted fake comments, even using the names of “dead people”1 and noted pro-Net Neutrality advocates2 in an effort to thwart the democratic process. Now we need Congress to demand the FCC investigate and throw out fake comments. 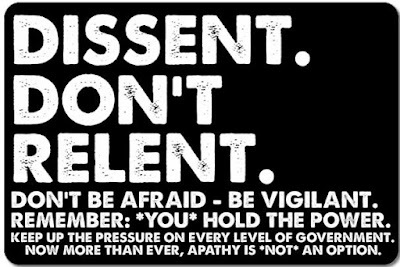 We’ve built an easy to use tool that will let you seamlessly send a letter to your local papers to demand your Member of Congress stand for an open Internet. We still have a chance to win this thing. But we have to act now. I have the feeling Google is working for the Establishment and are trying to marginalize or shut off any websites that go counter to their aims. We must resist! Keep fighting, folks! We've scared our congresspersons into turning down the trumpcare disaster. We've got to keep it up so they don't forget who's in charge--WE ARE!